Although a perfect fit for the paranormal romance genre, A WITCH IN WINTER avoids fangs, excessive body hair and submissive female leads, and tells the heart-wrenching story of a couple meant to be together, but being forced apart. Seth is utterly irresistible and Anna is an empowered, proactive young woman with unimaginable magic inside her. 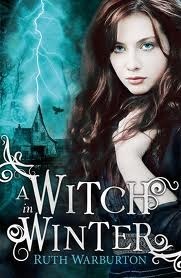 I really enjoyed a Witch in Winter and though it was a captivating and engaging read from the very first page until the last. I didn't want to put it down and needed to keep reading as I just wanted to know what happened next. I cannot wait to move onto book two very soon. Anna is the new girl in Winter. She's not all that happy about having to move out of London and start again in a seaside village living in the creepiest house in the neighbourhood. Within a day she manages to upset the local popular girl are talking to her boyfriend and some of the locals are plain rude. Within the first week she persuades some of the girls from school to stay the night with her and they mess about trying out some spells found in an old book Anna's father unearths in their house. The weird thing is that it's apparent once Anna returns to school that the spell may have worked and that doesn't make her popular at all. I loved several things about this book. Firstly. Loved Anna as a character and seeing the relationships she develops with the people around her. I enjoyed following her as she starts to discover more about who she is and where her powers come from and how she starts to find out more about her powers and what she can do with them. I loved Seth and thought he was totally gorgeous (why weren't teenage boys like him when I was 17). While Anna is understandably reluctant to get involved with him I loved it when she finally gave in to him and I cannot wait to see how their relationship develops in the next book. I loved the witchcraft element to the book and found the ideas really fascinating and enjoyed finding out more about this new world that Anna has just discovered. I also enjoyed the pace of the book the first section sets everything up and keeps you engaged as you start to find out about the world the book set in but the final section kicks off and is really exciting and fast paced. All in all a book I really enjoyed. I cannot wait to read the next instalment!